Many years ago over in China there was a lovely man who lived in a mountain village. Because he loved his beautiful wife and family so much he got up early every morning and he would pick up two pots with one of those sticks you put across your back, and he would walk for a mile and a half to a river to pick up clean water. This meant his family could get washed and have breakfast. It put a smile on his face seeing them happy. He did this every single morning. 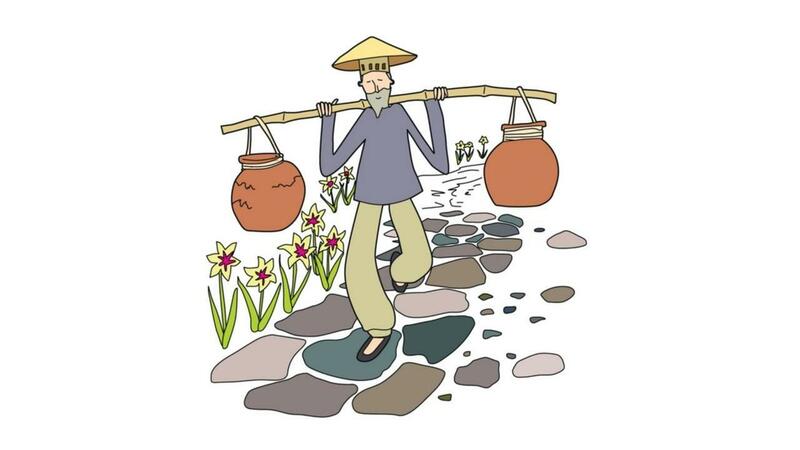 He would walk down the same path pick up the water in the pots, turn around, and then come back the same route every single morning. Being a perfectionist and loving order he did this the same way every morning. However this story is really about the two pots. One day the pots get talking to each other. One of the pots unfortunately had a few cracks in it and the water would leak out of it so by the time the lovely man had got back from the river to home the pot was only a third full. The other pot on the other hand was nice and shiny and brand new and had no cracks in it and didn’t leak. The cracked pot said, “Yes I have noticed this, it makes me feel great seeing the smile on his wife’s face every morning. “And have you noticed that the flowers only grow on one side of the path?” asked the perfect pot. “Yes it is strange isn’t it?” replied the cracked pot. “Why do you think that is?” asked the perfect pot. The cracked pot thought about this for a little while and realised that what was obviously happening was that as they were walking back from collecting the water every single day the cracked pot was watering the flowers and making the flowers beautiful. On the other side of the path where the pot was not leaking there was no water and no flowers grew. I think the secret as a leader is to understand that we all have imperfections and to understand what it is that you do to really add value to your team, to your business, to your family and to your life. When you search hard enough I’m sure you will find that you do add amazing value and you make someone’s life really beautiful. It’s not about being perfect, it is about being real and authentic.